Saul Canelo Alvarez will be fighting Liam Smith on September 12th in the US, Arlington, Texas. Smith’s WBO title will be up for grabs. Golden Boy Promotions have been hard at work attempting to ensure that the Mexican fighter will become the “face of boxing” for the current generation. But is their plan is as subtle as they are hoping it to be? Alvarez last fought in May when he faced Amir Khan, who stepped up two weight divisions. Alvarez was being outboxed by the faster British fighter but succumbed to a huge right hand in the sixth which laid him flat on his back, paralysing him from head to toe. 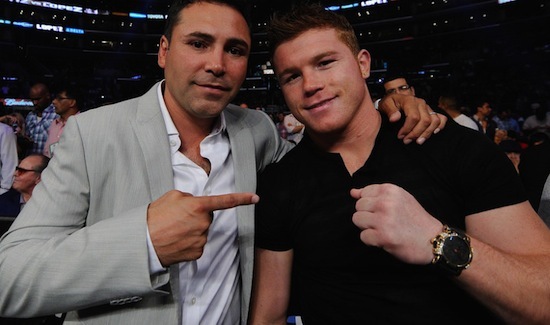 Both Alvarez and Kazakhstan fighter, Gennady Golovkin previously voiced their desire to fight one another for the right to be called the best in the middleweight division, but Canelo vacated his WBC belt when the organisation said the fight had to take place within a certain time frame this year. It was not a surprise to anybody! Golden Boy Promotions president, Oscar De La Hoya issued a statement saying that vacating the title would actually help move negotiations along more swiftly. Those were words that De La Hoya are possibly hoping that fans would forget considering there have been no new developments ever since. It does appear that the company are desperate to hang on to Alvarez for as long as possible with as little risk to his career as possible at this point. They have little else to rely on in their stable to make them as much money as Saul Alvarez. The trouble is, it is becoming painfully obvious what the real situation actually is becoming! While there is little doubt that Canelo would have the courage to face anybody in the ring, feasting on smaller guys does not help the position that him and his team are forcing upon themselves. The more analytical has already noticed his glaring technical flaws. Many will recall that he went the distance with the likes of Matthew Hatton and stopping the very open James Kirkland, and smaller men may only appear to the masses that he has incredible power. But if you rewind to about 4 or 5 years ago then the truth starts to expose itself. His fight with Miguel Cotto last November was a closely fought contest and some even say that Cotto did enough to win! To help minimise punishment taken in the ring, having good footwork is an important attribute. Canelo walks forward and uses next to no lateral movement although his upper body movement is competent and it’s something that helped him overcome Kirkland’s carelessly aimed bombs. Speaking of the James Kirkland bout, there was little to suggest that the Texas fighter would put Alvarez under any significant distress. Although the decision to take him on was not terribly substandard it was a shrewd move to keep the Canelo hype train moving a few inches along the track. Floyd Mayweather Jr may have his critics for his individual style of boxing but the man who calls himself TBE (The Best Ever) had the personality to make up for the lack of excitement he produced in the ring. His antics surrounding his career and in his personal life also produced a fair amount of controversy to keep fans on tenterhooks. Saul Alvarez, however, hardly speaks a word of English and does not appear that he has the persona to bother to be more vocal about his standing in the sport or what people think of him. Being more outgoing would certainly assist in enhancing his image but it looks as if he communicates with actions more than words, as he did when he dumped his WBC title. In fact, his foe Gennady Golovkin looks to have stolen his thunder, and long ago at that, with his exciting attacking fighting style. It will be time for Saul Alvarez and his team to shape up after his bout with Liam Smith takes place. He has just turned 26 and still has plenty of time on his side. But that does not mean that he should waste years of it away as Joe Calzaghe had done defending his WBO title against the likes of Branko Sobot. His last authentic challenge against Erislandy Lara took place over two years ago and Saul Alvarez has had his break. If things do not start looking up soon then Golden Boy Promotions may have to start looking elsewhere for a new “star.” And it may be recommended that Oscar De La Hoya turn to the likes of Don King and Bob Arum and learn how to make a fake diamond appear unquestionably like the real thing.